One of the most challenging things about being on an autoimmune elimination diet is that eggs, a cheap, quick and easy breakfast staple for oh so many, are out. You really need to adjust your perspective about what makes a breakfast, and embrace the heartier offerings that are going to keep you fuelled and full all morning long. 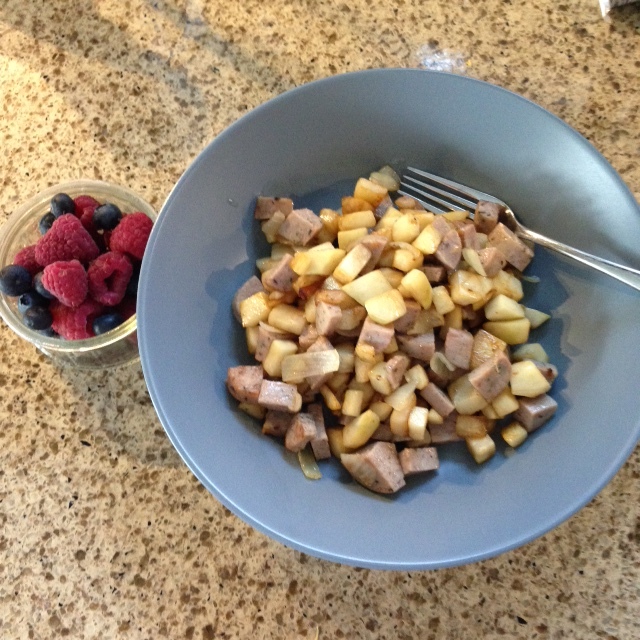 With potatoes also out for those following AIP, breakfast can feel downright depressing if you let it. Enter celeriac. Also known as celery root. Gnarly-looking but oh so delicious and packed with fibre and vitamins, it makes the perfect potato substitute for this hash recipe. If you need guidance on prepping it, see here. Once you do it a few times you’ll be a pro in no time! Seriously – I got my husband to prep these for me since I can’t chop super fine due to my wicked knife injury the other day and he did great. Like always, customize to your heart’s content – I’m sure sweet potatoes, taro or even yucca would be great subs for the celeriac. And if you don’t have onions, garlic or shallots would also work. No sausage? No problem. Simply serve as a side or with whatever protein you have on hand. If you can tolerate eggs I’m sure this would be ahhhmazing with a fried egg on top. I might even add in 1/2 of a diced apple next time I make this for a little added sweetness. Heat cooking fat over medium heat. Add celeriac and saute until it just starts to soften, about 8-10 minutes or so. Add in onion and cook another 2-3 minutes until softened. Mix in herbs and sausage and cook until heated through. Seriously, it’s that easy. You’re welcome – now dig in! Let me know if you make this hash and how you like it!